The Chicago Bulls of the Eastern Conference took on the Los Angeles Lakers of the Western Conference for the title, with Chicago having home court advantage. This Finals was Michael Jordan’s first NBA Finals appearance, Magic Johnson’s last one, and the last NBA Finals trip of the Lakers until 2000. The Bulls would win the series 4-1. Jordan averaged 31.2 points on 56% shooting, 11.4 assists, 6.6 rebounds, 2.8 steals and 1.4 blocks en route to his first NBA Finals MVP Award. 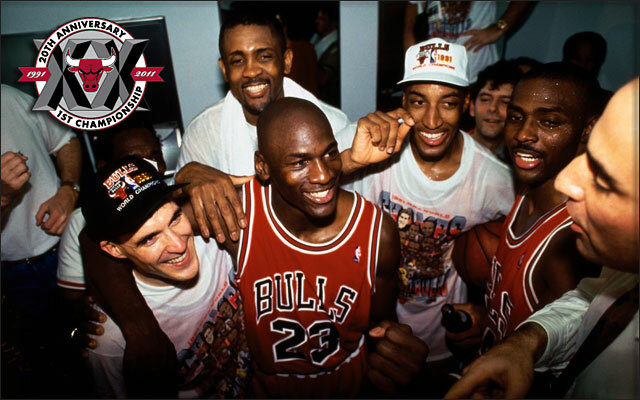 The 1992 NBA Finals was the championship round of the 1991 – 1992 NBA season. The Chicago Bulls of the Eastern Conference took on the Portland Trail Blazers of the Western Conference for the title, with Chicago having home court advantage, as they had the best record in the NBA. The Bulls would go on to win the series in six games. Michael Jordan was named Finals Most Valuable Player for the second year in a row, to go with his sixth straight regular season scoring titles.